Update, June 12: We now know all of Aatrox’s new abilities so you can see them below. League of Legends developer Riot Games has just confirmed the long awaited rework of Aatrox, The Darkin Blade. The fighter, who was first released way back in 2013, has seen a bizarrely low number of balance changes over the past five years. This ahs prompted some players to worry about how the champion is to play, especially when compared to other characters – many think he is overdue for some quality of life improvements. 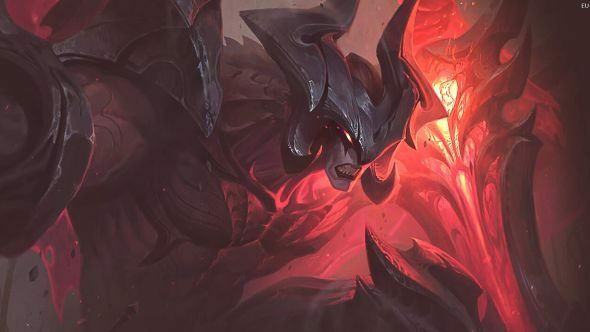 Fortunately, it seems Riot has been taking notes as Aatrox’s full reveal has just gone live, and it should answer some long-running concerns that players have had with the champion. Which is the best MOBA on PC? Below, you can take your first look at all of the champion’s reworked abilities. There’s also a look at some new lore, which seems to link Aatrox’s Darkin backstory with that of Kayn. Intrigued? Just wait until you watch the new trailers below. There is much to be discussed. Aatrox’s next basic attack has increased range and deals a percentage of the target’s maximum health as damage. This attack also significantly reduces all healing and shielding on the target for a few seconds. Deathbringer Stance’s cooldown is slightly reduced whenever Aatrox casts a spell or when he lands the edge of The Darkin Blade on a champion. Aatrox swings his greatsword up to three times. Each cast increases in damage, impacts a unique area of effect, and can hit with the edge of the blade (a second, smaller hitbox). Edge of the blade: Hitting enemies at the far end of the first two casts and the center of the third briefly knocks them up and deals significantly more damage. Aatrox smashes the ground, damaging the first enemy hit and briefly slowing them. If it’s a champion or large monster, they are chained to the impact area. If the chained enemy is still in the impact area after a few seconds, they are dragged to the center and take damage again. Passive: Aatrox heals for a portion of the damage he deals. Active: Aatrox dashes, increasing his attack damage for a few seconds. Umbral Dash can store up to 2 charges and can be used simultaneously with The Darkin Blade. Aatrox unleashes his full might, becoming monstrous in size and taking flight on massive wings. As he transforms, Aatrox fears nearby minions and briefly increases his movement speed (this bonus is reactivated when out of combat). While transformed, Aatrox increases his overall damage and gains a Blood Well that stores health over World Ender’s duration, reviving him if he takes lethal damage while in his true form. The original teaser trailer, which you can watch below, opens to footage of a battlefield, with a soldier’s eyes turning to Aatrox’s sword, before it’s pulled back to the champion – hinting at one of his new abilities. Then Aatrox appears, lighting up the fog of war as he goes to town on some unwitting enemies. The trailer closes on a shot of Aatrox standing over the soldier, before turning his gaze downwards. The rework has nothing to do with the League of Legends Wolf and Lion tease, which was released over the weekend. That was revealed to be a teaser for new Legendary skins for Darius and Garen. Expect to see Aatrox appear in the next League of Legends patch.